For more than a decade, the Natural Resources Defense Council (NRDC) has been suing the U.S. Navy over its use of high-intensity military sonar during training exercises in whale habitats. As I narrate in my recently published book, War of the Whales: A True Story, naval sonar was first linked definitively to mass strandings of whales following U.S. Navy war games in the Bahamas in March of 2000, which the Navy's own investigation concluded caused 16 beaked whales of three species to beach across a hundred miles of coastline. The legal battle over military sonar culminated in the U.S. Supreme Court in 2008. But the courtroom confrontations continue, as NRDC and Earthjustice are currently suing the Navy over its sonar and explosives trainings off the coasts of California and Hawaii. Meanwhile, whales continue to wash ashore during sonar exercises. As recently as April of this year, at least five beaked whales stranded and died in Crete during joint antisubmarine exercises among the U.S., Israeli, and Greek navies. And on Saturday, July 26, the National Oceanic and Atmospheric Administration (NOAA) launched an investigation of a fatal whale stranding in Hawaii during US Navy-hosted joint exercises involving 22 foreign navies. A whale on a beach has always been a mystery that cried out for explanation. Ancient coastal dwellers from the South Pacific to the Bering Sea interpreted strandings as a bounty of food and other blessings sent to them by their gods. In the fourth century BC, Aristotle remarked on the conundrum of beached whales in his Historia Animalium: "It is not known for what reason they run themselves aground on dry land; at all events it is said that they do so at times, and for no obvious reason." Millennia later, at the end of the twentieth century, marine scientists were still pondering the question Why do whales strand? And why do they sometimes strand en masse? Many theories had been advanced, none of them definitive. Since toothed whales and dolphins are particularly prone to stranding, researchers looked to possible sources of biosonar navigational errors. One hypothesis suggested that echolocating whales have trouble discerning gently sloping coastlines, which would explain mass-stranding hot spots such as Ocean Beach in Tasmania and Western Australia's Geographe Bay. Baleen whales-such as humpbacks, grays, fins, and blues-follow long migration paths and are believed to navigate by magnetically tracking iron deposits in the earth's crust. Some researchers speculate that when earthquakes rearrange the tectonic plates in the ocean floor, misaligned veins of iron ore can misdirect migrating whales into shore. Whales that hunt close to shore are the most likely to run aground-though paradoxically, killer whales that hunt sea lions in the shallows rarely do. The strong social bonds of certain species, such as pilot whales, have led some scientists to embrace a "follow me" theory of mass strandings: pods that hunt close together, often following a lead animal, might strand when the leader is caught in a strong onshore current. 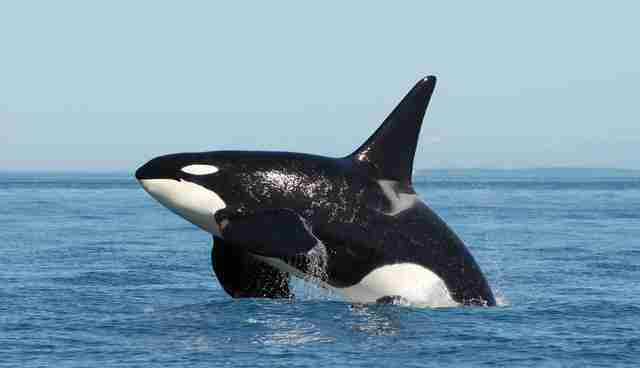 An orca from the Southern Resident Community of Puget Sound that Ken Balcomb has been surveying since 1976. One fact is not in dispute: whales and dolphins have been stranding for as long as they've lived in the oceans. Most of them die at sea, either from old age or disease, and then wash ashore with the tide. Occasionally, they strand alive, usually alone, sometimes in groups. For the vast majority of whales that strand alive, the beach is their final destination. When Congress passed the 1972 Marine Mammal Protection Act, it assigned Fisheries with the task of enforcing its provisions and determining if any laws, civil or criminal, had been violated. Any marine mammal that stranded on US shores or nearby coastlines immediately became the property of Fisheries for investigative purposes. But Congress never properly funded its marine mammal mission, and Fisheries was none too eager to embrace it-especially when fishing and marine mammal interests conflicted. Until the 1970s, the agency's central focus had been managing the country's fishing stocks for the benefit of American fishing interests. When dolphins became ensnared in tuna fishermen's nets, or when orcas competed with fishermen for Chinook salmon, it was Fisheries' job to untangle the legal and commercial threads. In the minds of many Fisheries administrators, whales would always be "fish out of water" at their agency. But the same public that had pressed Congress to pass the Marine Mammal Protection Act was passionate about saving whales and other marine mammals. Volunteer stranding response groups quickly sprang up along American coastlines to alert Fisheries of stranded animals. By the late 1990s, Fisheries was coordinating over a hundred local groups of volunteers inside its National Stranding Response Network. 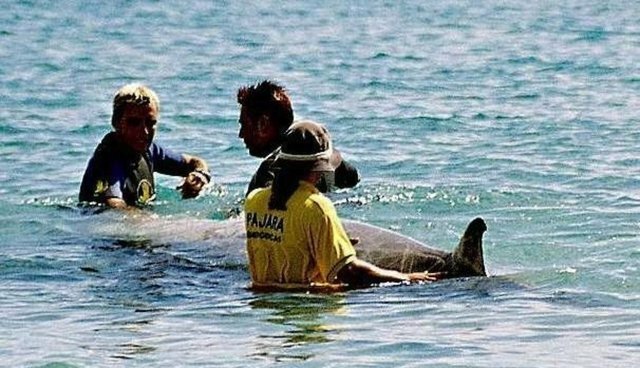 Most citizens volunteered in hopes of rescuing stranded whales from the beach. In reality, relatively few marine mammals stranded alive, and most that did ended up dying on the beach. In 1999 approximately 1,500 marine mammals-including whales, dolphins, porpoises, seals, sea lions, and manatees-beached on US shorelines. All but two hundred of them had already died at sea, mostly from disease or old age. Of the two hundred that live-stranded, some were euthanized by Fisheries officials. Most of the others soon died of exposure to the elements, or suffocated when their bodies collapsed under their own weight, or drowned when the high tide washed over their blowholes. Only five marine mammals that stranded live that year were actually rescued from the beach and returned to the ocean. In the case of most strandings, Fisheries's primary job was to safely dispose of the bodies. A dead whale was an ideal environment for anaerobic microorganisms and can quickly become a biohazard. Beyond containing the immediate health risks associated with active bacteria, Fisheries faced the engineering task of removing gigantic carcasses from the beach. It costs tens of thousands of dollars in manpower and heavy equipment to dismember, remove, and dispose of a single large whale. Beyond beach cleanup, it was also Fisheries's responsibility to sort out the why's and wherefores of any "Unusual Mortality Event," or U.M.E, as defined by the Marine Mammal Protection Act: "A stranding that is unexpected; involves a significant die-off of any marine mammal population; and demands immediate response." In response to a stranding it designated as "unusual," Fisheries would dispatch one of a small roster of marine mammal pathologists to the scene to investigate, perform a necropsy on-site and recover evidence for laboratory analysis. Fisheries investigations sometimes became crime scenes whose evidence trails led to prosecutions. If, for instance, a hunter or a hooligan had used a harbor porpoise for target practice, a pathologist with the right training and equipment could compile a complete ballistics profile. As human development increasingly encroached on marine habitats, more whales and dolphins turned up dead or dying on beaches. Many drowned after becoming entangled in fishing nets and floating plastic refuse. Fatalities from collisions with commercial ships and recreational boats increased year by year. And runoff from agriculture fertilizer created toxic, sometimes lethal, algae blooms that passed up the food chain from zooplankton to fish, and finally to whales and other marine mammals. Despite the rise in marine mammal deaths from human activity, Fisheries designated relatively few strandings as Unusual Mortality Events. From 1991, when the UME investigative program was initiated, until a mass stranding in the Bahamas in 2000, fewer than twenty events had been so classified, and most of those involved seals and dolphins. Fisheries had resisted classifying any whale deaths connected to the navy exercises as "unusual." While the investigative pathologists were civilians working at academic researcher labs like Woods Hole Oceanographic Institution, those same labs and researchers were usually funded by the Office of Naval Research. The potential for conflicts of interest was ubiquitous. 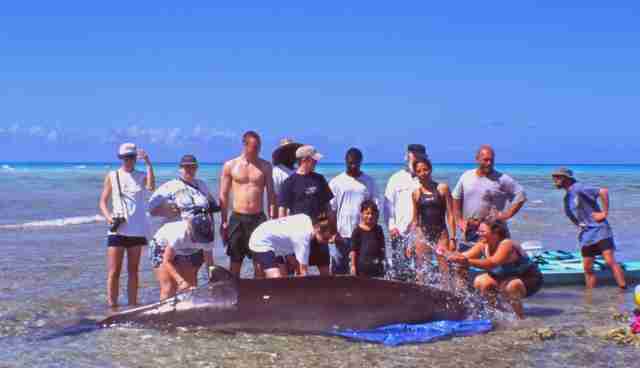 A Cuvier's Beaked Whale that stranded in the Bahamas on March 15, 2000, when sixteen whales of three species beached along 100 miles of Bahamaian coastline. The first suggestion of a possible link between navy exercises and whale strandings emerged in 1991 when two European researchers (M. P. Simmonds and L. F. Lopez-Jurado) wrote a letter to the correspondence section of the journal Nature titled "Whales and the Military." The authors noted that three recent mass strandings of whales in the Canary Islands in 1985, 1988, and 1989 coincided with nearby NATO naval exercises. It was such a small and speculative item-more a curiosity than a finding-that few cetologists took notice. It wasn't until the Greek stranding in May 1996 that the wider community of marine mammal scientists seriously considered a connection between mass strandings and naval sonar exercises. On May 11, NATO naval forces began antisubmarine training exercises at the edge of the three-mile-deep Hellenic Trench in the Ionian Sea. On May 12, twelve Cuvier's beaked whales stranded on nearby beaches. Because it was peak tourist season and many of the strandings occurred on resort beaches, local officials quickly buried most of the dead whales. 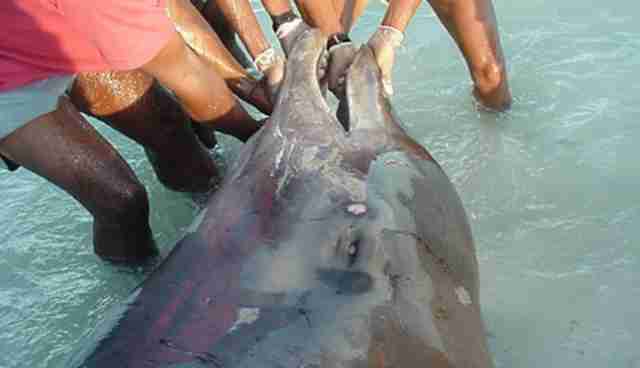 Cuvier's Beaked whale that stranded alive on Rocky Point, Abaco in the Bahamas on March 15, 2000. Earthwatch volunteers, working with Ken Balcomb and Diane Claridge, helped return the whale to the water when the tide came in. Several days later, Dr. Alexandros Frantzis, a Greek biological oceanographer and founder of the Pelagos Cetacean Research Institute, exhumed and examined eleven of the whales, nine of which were immature males. He supervised limited necropsies of the partially decayed animals. But as Frantzis explained in a paper he subsequently published in the journal Nature, "No ears were collected, no entire organs or histological samples were conserved because of problems related to permits, lack of facilities and means, and lack of relevant knowledge and trained specialists. In photos taken at the time, four of the whales were bleeding from the eyes." 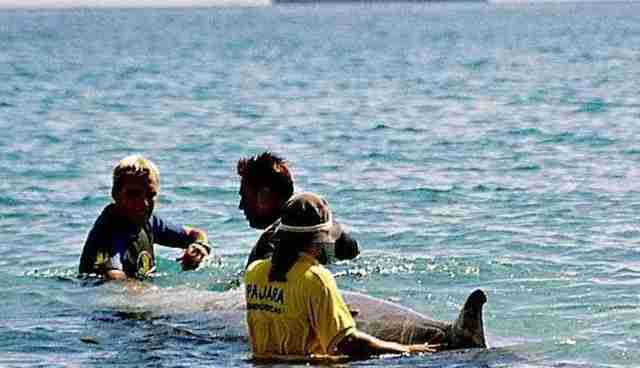 A beaked whale that stranded in the shallows in the Canary Islands during NATO sonar exercises in 2002. Because the stranding happened in plain sight of tourists, and because of Frantzis's independent inquiry, NATO was forced to investigate. Experts were assembled from around the world, including a delegation from the Office of Naval Research. The investigators examined the full range of possible causes such as underground earthquakes, magnetic anomalies, major pollution events, and conventional military exercises. All possible causes were eliminated-except for the mid- and low-frequency active sonar exercises NATO had conducted in close proximity to the strandings. However, the final NATO report found no conclusive evidence of a direct causal link between the exercises and the strandings. Stating that "the adverse effect of sonar on marine mammals has been poorly studied," the NATO investigators called for further research. Sixteen years after that stranding in Greece, there is now consensus among marine biologists that naval sonar poses a range of lethal and nonlethal threats to whales and other marine mammals. Yet the U.S. Navy had failed to take the steps necessary to prevent whale from washing ashore during sonar exercises on its foreign and domestic training ranges. Excerpt and images published with permission from Joshua Horwitz and Simon & Schuster. 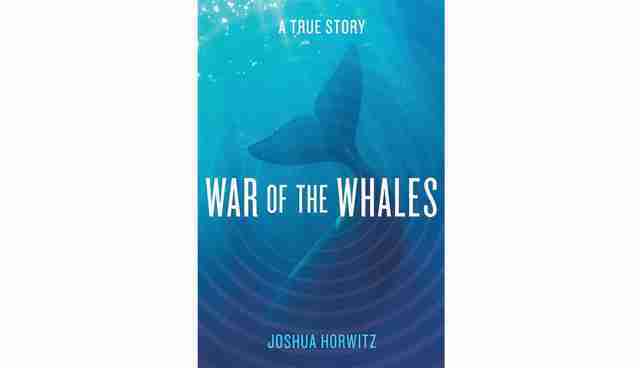 You can purchase War of the Whales: A True Story here.